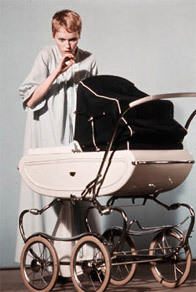 Cast: Mia Farrow, John Cassavetes, Ruth Gordon, Sidney Blackmer, Maurice Evans, Ralph Bellamy, Elisha Cook Jr.
Rosemary’s Baby is a complex film that works on several levels. On a patent level, it evokes the horror and fright that audiences seek in films of this genre. Yet this description is rather misleading in that this film’s horror is all of a “close room”, psychological variety. Ultimately, the film can be regarded as an exquisite study of the relation between appearances and reality, showing us how the careful planning of crafty, evil people clouds young mother Rosemary’s sense of morality. Those seeking the rewards of being frightened through the use of visual stimulation will miss the point of this film altogether. Rosemary’s Baby is a sinister film that is made convincing through the patience displayed by those who entertain malefic motives. The film opens with an aerial shot of Manhattan and Central Park. The camera then settles gingerly on the legendary New York landmark, The Dakota, an imposing, gothic, castle-like structure. The Bramford, as this apartment building is called in the film has a storied, though strange past, as Rosemary (Mia Farrow) and her husband, Guy Woodhouse (John Cassavetes), are told. As it turns out, no situation, event, gesture or nuance is gratuitous in Roman Polanski’s fine film. It is no mere coincidence that Rosemary and her actor husband should move into this grand place. Of course, at first these two young people do not suspect or believe that anything supernatural has ever taken place in the dark, maze-like interior of this historic building, but they are warned nonetheless: “This house has an incidence of unpleasant happenings”. The building, it appears, has a history of infant mortality and Satanism. Mrs. Gardenia, the old woman who used to live in the apartment that the Woodhouses move into, was a friend of the Castevets (the elderly neighbourly couple who ultimately prove to be the leaders of the coven of witches). She grew magical herbs for them. Part of what makes this film work so well is the counterpoint that takes place between Rosemary’s claustrophobic, isolated existence away from family and friends, and the few scenes of her walking on the streets of New York. Rosemary is seemingly held captive by invisible forces that do not allow her to stray away from her apartment for too long. But these forces are defused through Guy’s and the Castevets’ baleful ambitions. From the start of the film, Guy comes across as rather shallow while Rosemary seems merely naïve. The subtlety of evil that the film presents is successful because of the exquisite timing deployed to tell the story. Rosemary’s Baby provides a measured depiction of evil within Rosemary’s day-to-day environs. Rarely are cinematic characters as sinister, yet likeable as Minnie Castevet (Ruth Gordon), Roman Castevet (Sidney Blackmer) and Dr Sapirstein (Ralph Bellamy). Minnie and Roman are truly black-hearted people. Seemingly quirky and nosey, they hide their true intentions behind an outwardly loving and giving veneer. The Castevets never flex their muscles or twist anyone’s arms until the very end of the film. They do not have to. Guy has made a selfish and evil pact with them, and Rosemary lacks the necessary perspicuity to see through their intentions. The Castevets work their web of deception by jabbing a path through the unsuspecting ways of moral simpletons. This is enough to debilitate Rosemary’s resistance until the end of the film, when they must explain and justify the existence, and her carriage of the devil’s son. After Terry, a girl that she and her husband have taken in commits suicide, Mrs Castevet comes to Rosemary’s apartment to thank her for helping the police figure out the girl’s identity. But Mrs Castevet quickly changes the topic from the girl’s death to Rosemary’s interior decoration. This serves as a sign of things to come, especially in terms of the control over people that the Castevets enjoy. Minnie is a seemingly perfect “picture” of a shallow and callow entity. The initial control over Rosemary that these two Satanists will come to enjoy takes place through an off-camera deal they have made with Guy: the Castevets vow to help make his acting career triumphant if he will facilitate the impregnation of his wife by Satan himself. This is essentially the plot of the film. Yet it works phenomenally well precisely because this baneful pact takes place off-camera. It is only over time that we learn that the Castevets, Dr Sapirstein, and all their friends are part of a web of devil worshipers that dates back to the 1800s, to the infamous Satanist Steven Marcato, Roman’s father. Rosemary’s Baby, like The Omen (Richard Donner, 1976) and many other films in this genre, deals with the topic of the Devil’s progeny. These two films are, however, the most effective and convincing entries in this subgenre. The chilling culmination of Rosemary’s Baby’s horror is made evident at the end of the film when the entire plot is revealed to Rosemary – and the audience. Roman tells her to “Be a mother to your baby”. And when Rosemary complains: “What have you done to his eyes?” Roman nonchalantly tells her, “He has his father’s eyes”. The entire spectrum of the horror that engulfs Marcato’s past, the apartment building, Mrs. Gardenia, Terry’s death, and the Woodhouse’s decision to move into this building is revealed when Roman tells Rosemary that she was chosen – an inversion of Christ’s virgin conception. Whether Rosemary eventually comes to accept her son is left up to the discerning viewer. However, perhaps the most intriguing question raised by Rosemary’s Baby is whether a mother can care and hold maternal feelings for such a monstrous offspring. Roman Castevet seems to think so.